I turned 50 a few months ago. The older I get, the younger that seems. So much of my life "seems like yesterday." 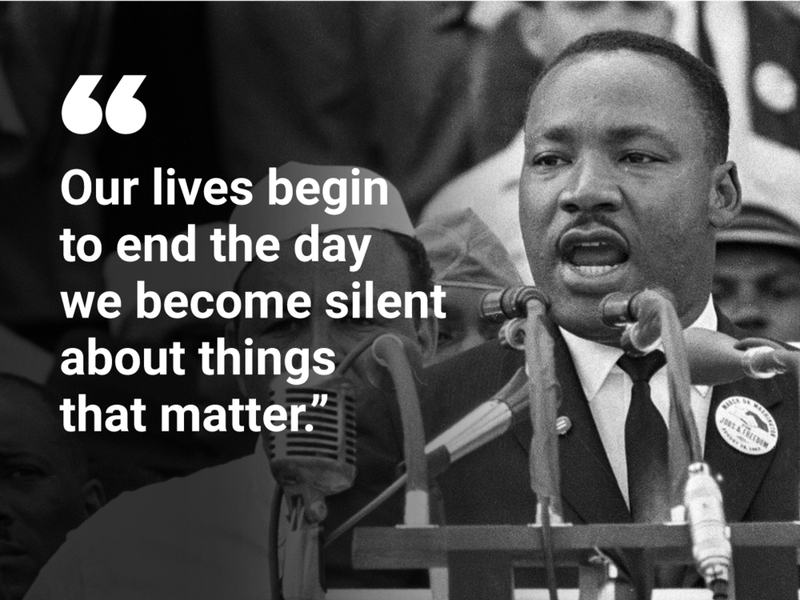 50 years ago, months after my birth, Dr. Martin Luther King, Jr. was assassinated. Instead of feeling like yesterday for me, it might as well have been centuries ago. That's how it feels- so, so long ago. I think that the reason so much of my life "seems like yesterday," is because it is mine - my life, my memories, my sadness, my joy. It's mine. 50 years of life shaped by all the things that have impacted me, personally, deeply. The reason the death of Dr. King, and ultimately the fight that killed him, seems so distant to me is that it hasn't really been mine. It is so difficult to believe that there was a time when people of color couldn't vote, couldn't eat in restaurants, watch movies and were required to ride in the back of the bus (just to name a few). I have no memories of those days and yet they were in my lifetime. Because they didn't negatively impact me or my family, because they were not injustices toward us, they don't "seem like yesterday." A lot has changed in 50 years, voting, marriage, sharing space, admittance to schools and universities... but a lot remains the same. Like most of my life the impact of what hasn't changed escapes, or I escape it because I am white, because I am a part of what always has been the majority and the power. I don't see the same wrongs, the same prejudices. I don't experience them. They are rarely my life experiences. But that isn't the case for everyone, even 50 years later. 50 years later much has changed. But much has not. I am thankful that God raises up men and women like Dr. King and the thousands who joined him to call for justice. I am thankful for the resilience, persistence and bravery of those who took stands and those who still do. But there is still work to do. I can be honest and open my eyes to the world around me. Rather than excuse or making excuses, I can simply acknowledge that there is a lot of life that I have never experienced, but it is real. Racism is real. Prejudice is real. And these truths have not only divided us, they have shaped us in one way or another and they continue to shape us and the world we live in. I can stop being indifferent. Indifference is never truly indifference. Indifference allows and even feeds continued racism, prejudice and injustice. I can speak to my children, to my family, to my small group, to my church. I can stop being indifferent and use the voice I have in the places it can be heard. I can be the one who tries. Let's be honest - there is fear in change and fear in trying. What if I fail? What if I try and am met with resentment? What if? What if? What if? There is fear and uncertainty and distrust deep within and it isn't limited to any color. Some is reasonable fear and some is not. I can face the fear. I can take the chance. I can move toward genuine friendship and understanding. I can be the one who tries, the one who not only tries to understand but who tries to wade through the awkward unknown and be a true friend. I can take the first steps. I can open my heart. I can open my home. At New City Church we are committed to trying, to doing what we can do. We are committed, not because it is trending and popular but because we deeply believe it is connected to the gospel. Racism, prejudice, injustices, they are all sins. Jesus has come not only to forgive sin, but to empower us to break sin's curse and overcome it. The gospel also fixes what has been broken and unites what sin has divided. In Christ there is no divide; there is only one new people - His people. If there is anywhere that love and unity should be brilliantly seen, it is His church. "Father, I plead that your Spirit would be mighty to do what Jesus said He would do. Convict us of our deep and dark sins. Remind us of the work of Jesus that leads us to love and unity. Move in your people to be just that- your people- holy, different, set apart. Help us to be the Kingdom present here and now for your great glory and for the good of your people. Father, may our children and our children's children have no understanding of the division that we live in. In Jesus' name we pray this together. Amen." Newer PostI want to, but I'm just not sure how. Older PostNew City Student Fundraisers!